In my 25 years in the insurance and annuity industry, I have seen all sorts of financial mistakes, a lot of which have been made by other advisors and attorneys of my clients prior to them arriving at Senior Financial Security, Inc. These are some of the biggest, and most common, mistakes I have seen to date. 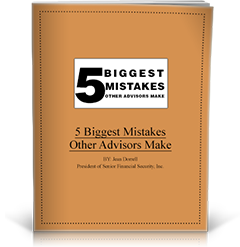 Please fill in the fields below to download your copy of ‘5 Biggest Mistakes Other Advisors Make’.